Flying economy (coach) or premium economy on Singapore Airlines (SQ) and want to get the best seat on board? Passengers on Singapore Airlines can purchase allocated seats in advance of their flight – these can be either Extra Legroom Seats, Forward Zone Seats or Standard Seats. Extra Legroom Seats (formerly Preferred Seats) are seats located on the emergency exit rows or on the bulkhead rows in the economy and premium economy cabins. Depending on the route these cost between US$25 and US$120 per flight sector. They can be purchased at anytime up to 48 hours before departure – either when booking the ticket or using the “Manage Booking” facility on the Singapore Airlines website. It is possible to check the availability of Extra Legroom Seats during the booking procedure before actually completing the purchase. Passengers booking exit seats should be able to fulfill the standard eligibility requirements for flight safety reasons. Band 1: Between Singapore and Brunei, Cambodia, Indonesia, Laos, Malaysia, Myanmar, Philippines, Thailand, and Vietnam; between Australia and New Zealand; between Russia and Sweden. Band 2: Between Singapore and Australia, Bangladesh, China, Hong Kong, India. Japan, Korea, Maldives, Nepal, Sri Lanka, Taiwan, and U.A.E. Band 3: Between Singapore and Denmark, France, Germany, Italy, Netherlands, New Zealand, Russia, South Africa, Spain, Sweden, Switzerland, Turkey, and United Kingdom; between United States and Germany, Hong Kong, Japan, Korea, and United Kingdom. Band 4: Between Singapore and United States. The number of possible Extra Legroom Seats varies by aircraft type and configuration. Let’s first take a look at the largest aircraft, the Airbus A380. (1) The original Airbus A380-800 layout (shown below) which has economy cabins on both the main deck and upper deck. This means the highest number of Extra Legroom Seats available with a total of 25 economy seats and 4 premium economy seats. (2) The Airbus A380-800 with all business-class layout on the upper deck. This has 13 Extra Legroom Seats in economy class and 4 seats in premium economy. (3) The new suites and business class layout on the upper deck. This configuration has 18 Extra Legroom Seats in economy class and 4 seats in premium economy. So what are the best economy seats to book on a Singapore Airlines A380? It obviously depends on which aircraft is flying on your route. For the original A380 layout (1) we would advise sitting on the upper deck economy cabin as it has a 2-4-2 rather than 3-4-3 seating layout. The upper economy deck has a quieter and more intimate ambiance than the large cabins on the lower deck. The pick of the bunch are the seat pairs on row 81 – seats A/C or H/K in the “mini” cabin right at the back. We enjoyed flying in seat 81C on a London-Singapore flight some years ago, although the cost at the time was only US$50. Today the price has increased to US$90 for Europe-Singapore flights. Do be aware that all the A and K “window” seats which are designated Extra Legroom Seats on the original (1) and all-business (2) layouts have exit doors and are all therefore windowless. However on the new suites class configuration (3), the best economy seats are the seat pairs 41B/C and 41H/J or the extra legroom 42A/K window seats – these are just behind the premium economy cabin. Or at the back you have seat pairs 70B/C and 70H/J or the extra legroom 71A/K window seats. All the premium economy extra legroom seats are on row 31A/C or 31J/K on all 3 aircraft layouts. The best one is on the new suites class as the premium economy cabin is right at the front of the main deck. 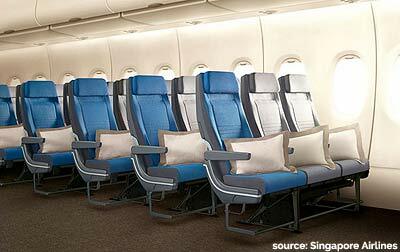 The Airbus A350-900 with Singapore’s new seating has 6 Extra Legroom Seats in economy and 4 in premium economy. These are all very good. Premium economy again has seating pairs 31A/C and 31H/K; economy class has 2 seat pairs 47B/C and 47H/J – great for couples travelling together. For lone travellers there is the extra legroom window seats at 48A or 48K. 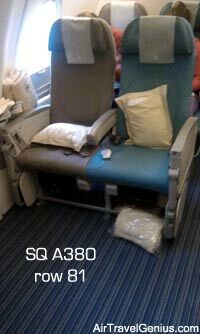 The Airbus A330-300 has 4 Extra Legroom Seats in economy class. These are seat pairs 48A/C and 48H/K. Singapore Airlines has a number of different Boeing 777 aircraft and configurations which have between 3 and 10 Extra Legroom Seats on board. For example let’s take a look at the Boeing 700-300ER. The 3-class layout has 10 Extra Legroom Seats in economy class at exit rows 31 and 44. The 4-class version also has 10 Extra Legroom Seats in economy class (rows 41 and 49) plus 4 premium economy seats (row 31). For other configs do check the seat map. 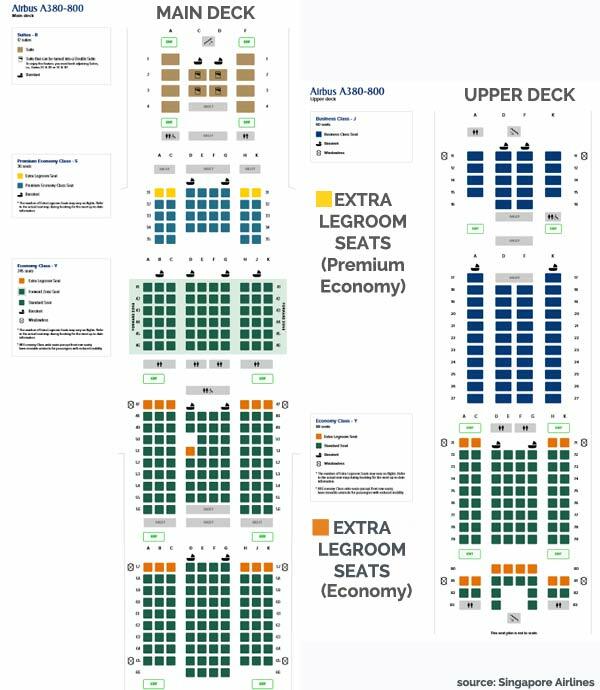 Extra Legroom Seats are also on sale for SilkAir flights. Note Singapore Airlines has a strict no refunds policy for Extra Legroom Seats if a passenger cancels the flight. Also, Extra Legroom Seats are non-transferable – they cannot be given to someone else nor can one select another Extra Legroom Seat without re-paying the fee. Is it possible to get Extra Legroom Seats for free? Technically yes, once online check-in opens 48 hours before departure any unassigned Extra Legroom Seats should be made available for free selection. PPS Club members (Singapore’s elite status, members need to spend a minimum of S$25,000 annually) also get free Extra Legroom Seats, subject to availability. Note that KrisFlyer Elite Gold (Star Alliance Gold) do not get complimentary Extra Legroom Seat assignment. There is no fee for those on Flexi fare tickets. There are no Standard Seat fees for passengers on Standard or Flexi fares. KrisFlyer Elite Gold members do get complimentary Forward Zone Seats and Standard Seats assignment. One final note, Singapore Airlines offers free seat assignment for Suites, First and Business Class passengers. If flying long-haul in economy class on Singapore Airlines it may be worth spending a few extra dollars to guarantee some extra legroom. On a 13 hour flight the comfort can make all the difference.